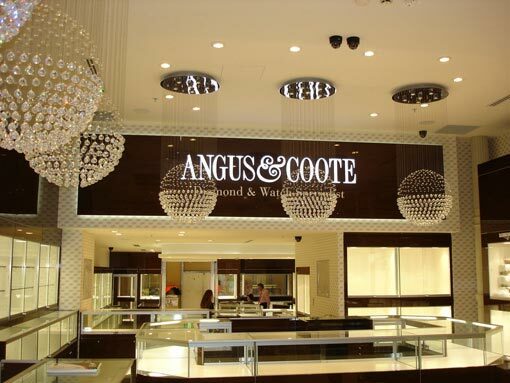 This is Angus & Coote's flagship store with the largest retail space of any of their stores. Our brief was to create a warm and inviting atmosphere where customers would enjoy the shopping experience, but at the same time illuminating the various jewellery and other products. This is Angus & Coote's flagship store with the largest retail space of any of their stores. Our brief was to create a warm and inviting atmosphere where customers would enjoy the shopping experience, but at the same time illuminating the various jewellery and other products. We used a combination of different lamp types and colour temperatures creating a warm and friendly environment without sacrificing the products appearance. The overall effect was very pleasing, both the client an dthe customers were extremely happy with not only the visual appearance of the store but how well the product was lit.